Modelling Human Diseases through Direct Reprogramming. Direct reprogramming of somatic cells into different lineages allows the generation of cell types that cannot otherwise be easily harnessed, such as human neurons from the central nervous system. This raises the possibility of modelling human diseases of the brain, eluding protocols based on iPSCs, which are highly demanding in terms of time and resources. This research team joins efforts to improve the efficiency of the direct neuronal conversion and uses this methodology to answer fundamental questions of human disease. After obtaining his biology degree at the Complutense University of Madrid, Sergio Gascón initiated his PhD studies in the field of neuroscience at the Instituto de Investigaciones Biomédicas "Alberto Sols" (Madrid), under the supervision of Dr. Margarita Diaz-Guerra. He focused his work in the glutamate NMDA receptors and several interacting postsynaptic proteins involved in the cerebrovascular disease and neurodegeneration. During his PhD work he moved to the previous laboratory of Prof. Peter Scheiffele (Columbia University) to develop lentiviral vectors for the efficient expression of recombinant proteins in neurons. 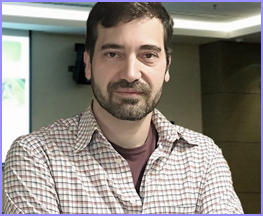 After completing his PhD training at the Universidad Autonoma de Madrid, Sergio moved to Munich, to the laboratory of Prof. Magdalena Götz, where he focused in the field of neuronal direct reprogramming. Currently, Sergio holds a group leader investigator position (Ramon y Cajal-Program) at the University Complutense of Madrid, and is co-affiliation to the Ludwig-Maximilians University of Munich.